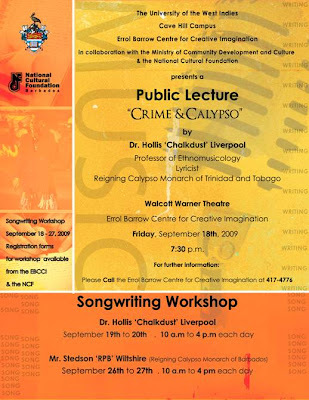 Hope to see you there – rare opportunity to hear Trinidadian Professor who’s not only a calypsonian but the Twin Island Republic’s ruling Soca Royalty (Perhaps you may recall one of his hits, “No Toilet“? Click on image for improved resolution)! De Carla S. Applewhaite BA UWI Hons. MA Brad.